Mark is coming to Hastings on 9th November. Our afternoon event will be a talk about comedy, art, politics and mischief in the St Marys Cafe and Bar, followed by a Q & A. All proceeds to HFS. 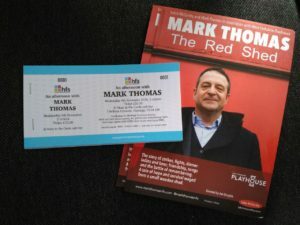 Mark is performing his award-winning Red Shed show in the auditorium in the evening too – don’t miss it. Tickets for the afternoon talk are £10 and all proceeds go to HFS. Tickets are available online and from the SMIC box office in person.